Startec > Magazine > Applications > BROADCAST SOWING IN ADDITION TO LOCALIZATION… NEW UPCOMING SOLUTIONS FOR THIS AUTUMN! In view of the incoming autumn, Startec and Augusta are presenting new combined solutions for broadcast sowing (e.g. cover or rapeseed) and localised fertilization with microgranules. 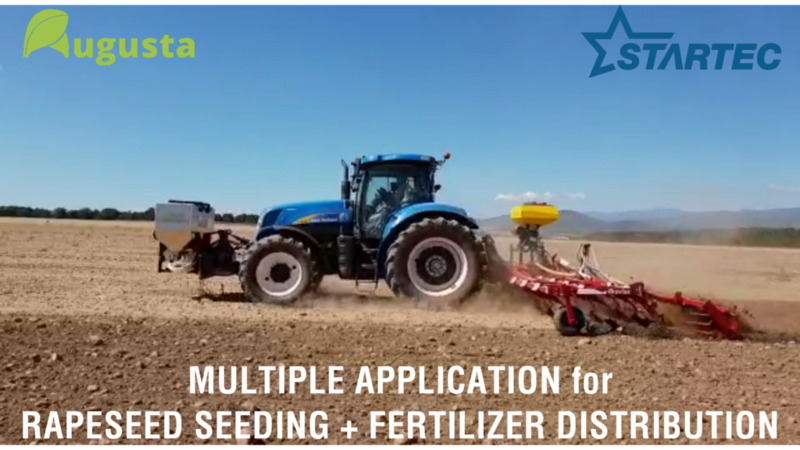 IIn this particular application, while working the soil, the rapeseed is sown (Kit Mikro GAMMA) and the microgranular fertilizer is distributed by localizing it (Kit MIK). Both distributions are managed by the MULTIPERFORMER SYSTEM in an automatic way and proportional to the advancement speed. In this application, the MULTIPERFORMER SYSTEM is available in the ISOBUS version. This ensures the regularity and precision of the distribution. The MIK’s tank for microgranular fertilizer has a capacity of 850 litres and, thanks to the pneumatic transport circuit, is able to transfer even high doses of product, in accordance with the agronomic prescriptions. The frontal installation is eased by the 3-point hitch, CAT II. The Mikro GAMMA kit is installed at the back, by means of supports, on the frame of the Ovlac operating machine. The capacity of the tank is 300 litres (capacities of 100 litres and 200 litres are also available) and its shape has been specially designed to facilitate installation on the various types of operating machines. The rapeseed seeds (but also covers, ryegrass and alike) are first dosed and then transported by the airflow fed by electric fans on the descent pipes. At the end of teach of the descent pipes, a wide-angle distribution system is fixed in order to guarantee uniformity in the distribution of the seeds.